Fiona is our Children and Young People Project Officer. An events expert, Fiona coordinates our flagship youth event, the School Games as well as our annual Bucks & MK Sport Awards. Fiona started her career in sport back in her childhood home of Scotland, delivering sport in both mainstream and special schools. She moved over the pond to New York spending 6 years working in a special needs summer camp and working 1:1 with an autistic teenager whilst she completed her Masters in Therapeutic Recreation. 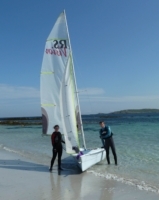 Outside of work Fiona enjoys spending time with friends and family and has a keen interest in water sports; currently developing her skills in sailing, surfing and windsurfing. She is also baking her way through a variety of lemon drizzle cakes in search of the perfect recipe!